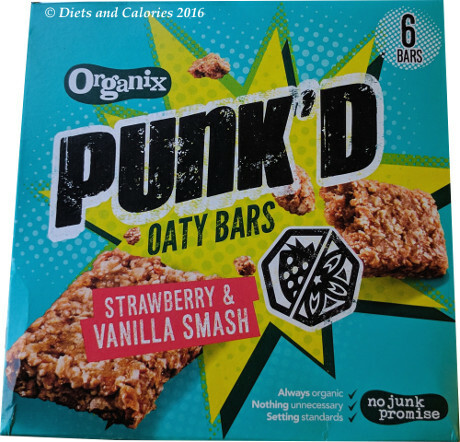 If you’re not really into the craze of snack bars made with squashed dates, you may be interested in these bars from Organix. 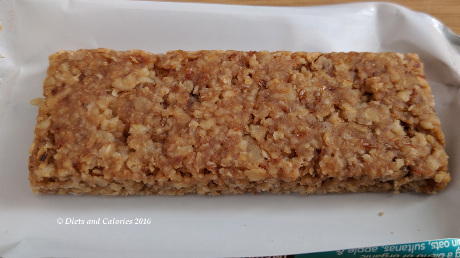 They're much more like a flapjack, something you really should avoid if trying to lose weight! 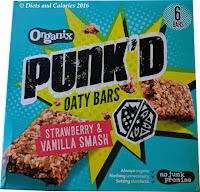 These oaty snacks bars go by the same ‘PUNK’d’, and they come in two varieties: Strawberry & Vanilla or Cocoa & Orange. 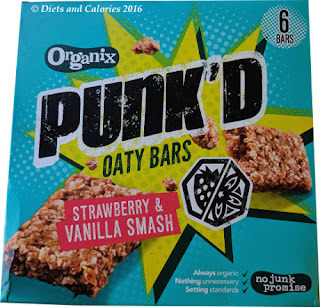 They’re totally organic and have just 93 calories per bar. I purchased a box of Strawberry & Vanilla bars from my local health food store, and they're also sold at Ocado and Amazon. Ocado sell the individual boxes with 6 bars and Amazon sell in multipacks of 6 x 6 bars. Looking at the ingredients I see they are virtually the same as the Organix Goodies range of oaty bars. I wonder whether this is some sort of rebranding, as they are so similar apart from the size. 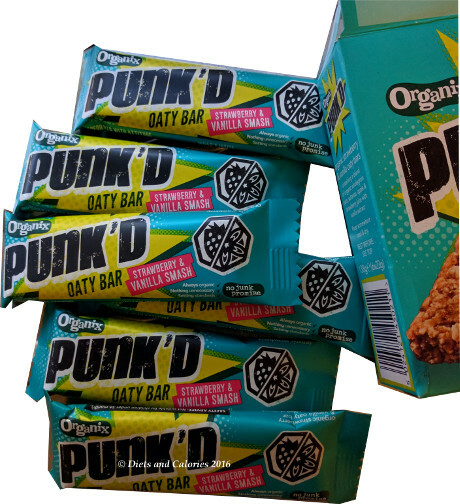 The PUNK’d bars are 23g compared to 30g for the Organix Goodies. This means the PUNK’d bars are under 100 calories whereas the Goodies are higher at around 125 cals per bar. They are small, but this is because they’re aimed at kids. If you’re after a little snack that’s reasonably healthy and quite filling, these are good. They’re soft and chewy but quite crumbly. If I didn’t know the flavour I would have said they were apple, and I didn’t really detect much of a hint of strawberry. Turns out the apple juice concentrate is greater than the strawberry juice concentrate so they should really be called apple & strawberry. Nevertheless, I liked these bars but will most likely give the rest to my daughter as a snack for her school lunches. She loved them and asked me to buy the other flavour as well. Although they are high in sugar per 100g from the sultanas, each bar has just over 1 teaspoon of sugar, so is OK as part of an overall balanced diet. Ingredients: Wholegrain oats, sultanas (contains sunflower oil), sunflower oil, apple juice concentrate, strawberry juice concentrate, vanilla extract. Nutrition Information per 23g bar: 96 calories, 3.8g fat, 0.5g saturated fat, 13.2g carbs, 5.5g sugars, 1.2g fibre, 1.5g protein, trace sodium, 0.01g salt.